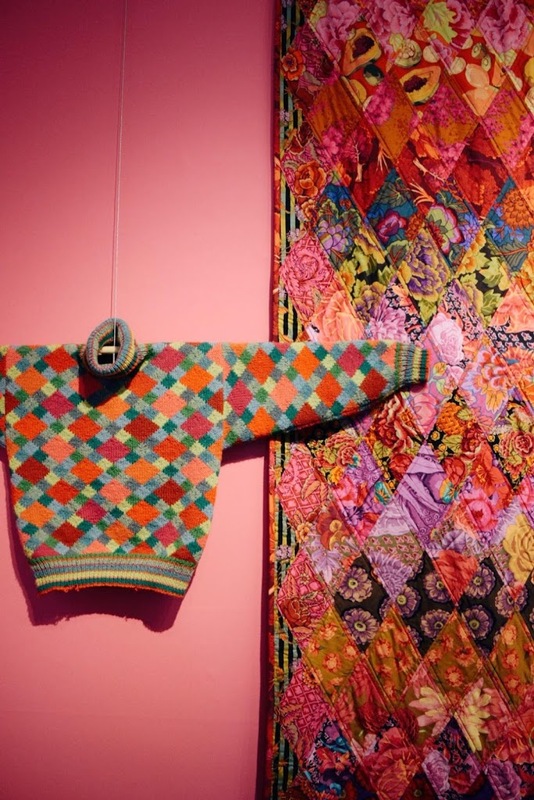 Kaffe Fassett exhibition: is fashion is a form of art? In the midst of a world orientated by innovative design and a constant feeling of change; art is something that, arguably, stands the test of time. Whilst there are differing opinions on what is good art, in fact we most probably all have a different favourite piece of art or artist and that is the beauty of it. There are constantly new pieces and artists that are new and upcoming. Sounds pretty similar to fashion right? It’s a constant that we all buy into, there’s a yearning for art in all of us. I suppose, that’s why sustainability, art and fashion all interweave so well. Art is a sustainable form; Monet did not paint his pieces for them to be discarded a few months late and as you can probably assume what I’m going to say; neither should fashion. 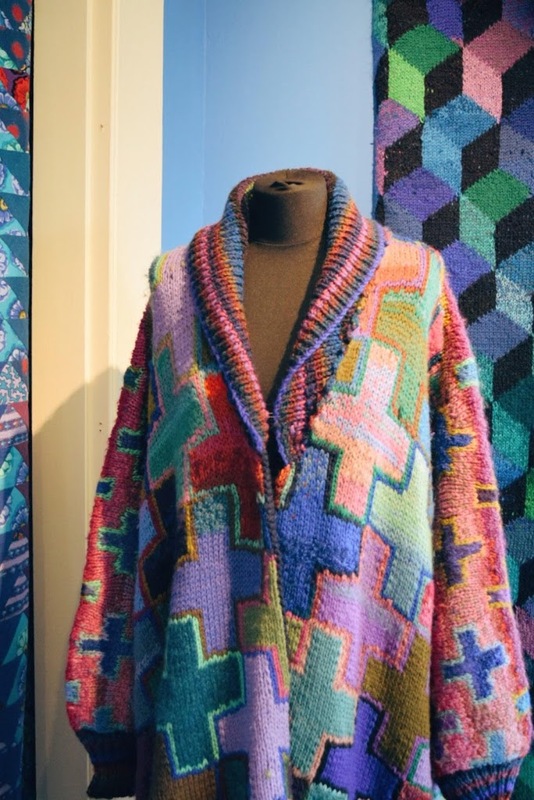 Last week I went to Mottisfont avec ma mére (bringing my renowned French into blog posts because my goal for the end of this academic year is to write a post in French) and had the pleasure of seeing the Kaffe Fassett exhibition. 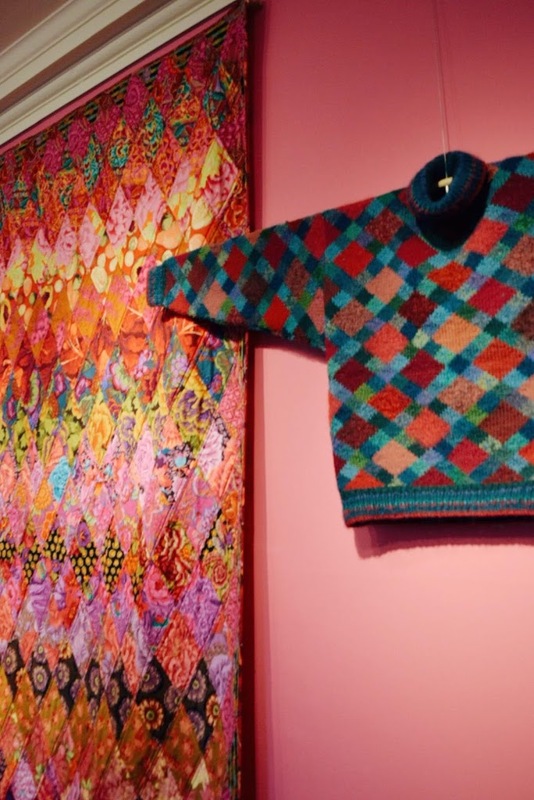 The exhibition celebrates the work of world-renowned artist Kaffe Fassett, this vibrant exhibition showcases a wide range of textiles from a career spanning over 50 years. 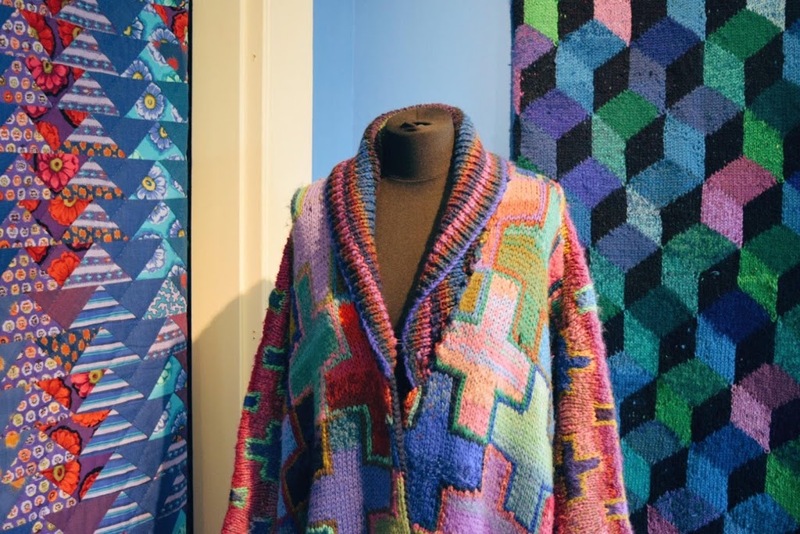 Our gallery has been transformed with pools of vibrant colour, providing the perfect backdrop for Kaffe’s distinctive knitwear, tapestry, quilts and more. 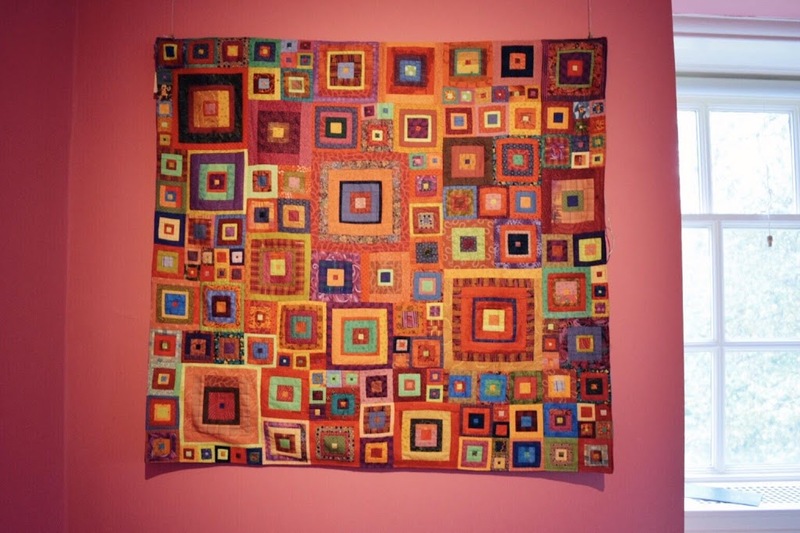 Kaffe Fassett has inspired people across the world with his works in fabric, knitting, needlepoint and patchwork, he’s also inspired my to hurry up and finish my Wool and The Gang jumper because a goal of mine is to finish it by the end of 2017, I’ve nearly finished the front and then I’ve just got the sleeves so hopefully I am on target! It’s interesting to know that he was the first living textile artist to have a one-man show at the Victoria & Albert Museum in London. Kaffe he has produced over 30 publications, including a number of ‘how to’ books, published in order to help other people find their creativity, he’s definitely #anewageinspiration! The pieces are accompanied by quotes from Kaffe about his inspirations, setting into context his passion for bold colours and styles. There was a lovely one about yellow being sassy and optimistic, so refreshing to see colour personified in such beautiful ways. There’s a brightness that surrounds the exhibit, you can’t help but feel a little more positive after viewing it. 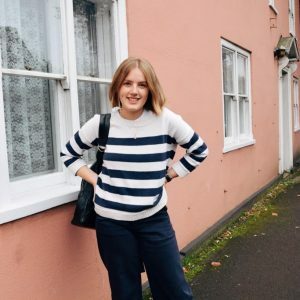 It inspired this post because seeing the colour and creations that Kaffe has developed was so hugely inspiring and made me realise how fashion is as much an art form as it is of practical use to wear and to buy. 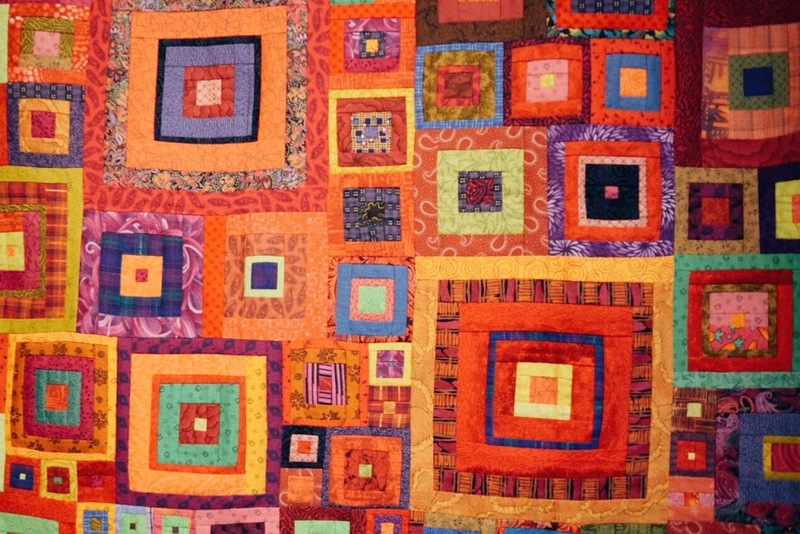 It has a purpose but when you consider the form it should be curated and developed into something that you admire. Looking at fashion in this way has almost enforced my view that fashion should be sustainable because it is a form of art and art is a sustainable form. As a result that is my philosophy of fashion. Perhaps it is not the most the best philosophy, nor has it got a lot of evidence as to why fashion should be sustainable but I guess if you regard fashion as art you may think of fashion as less disposable. 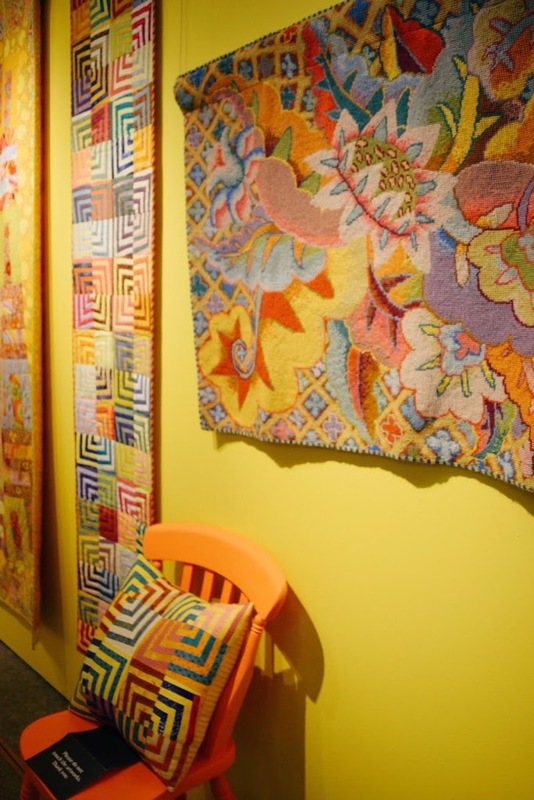 The exhibit opened my eyes as to the power that both forms have, so many people were looking at Fassett’s work with such admiration. 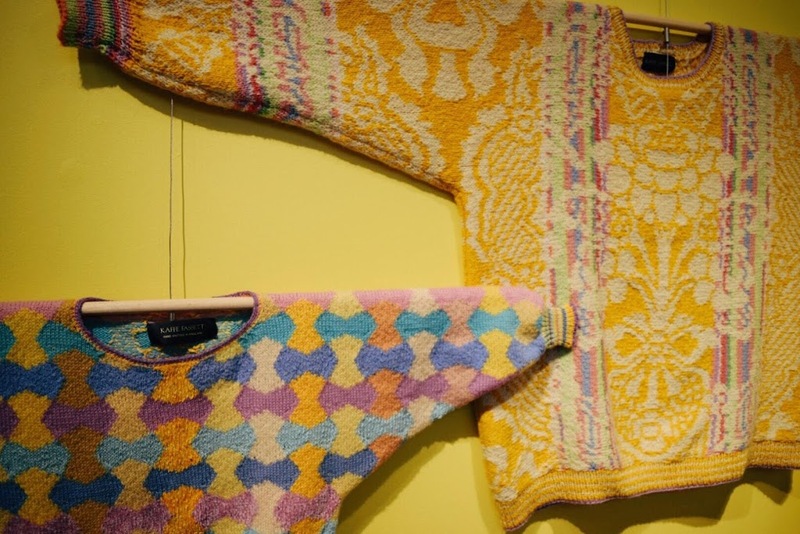 This including tapestry and needlework but it also including the knitting of jumpers and jackets, fashion garments one would usually take for granted. Shouldn’t fashion be regarded as art? As people walked past the garments they admired the work that had been put in, the artistry; but isn’t that in every piece of clothing we wear? 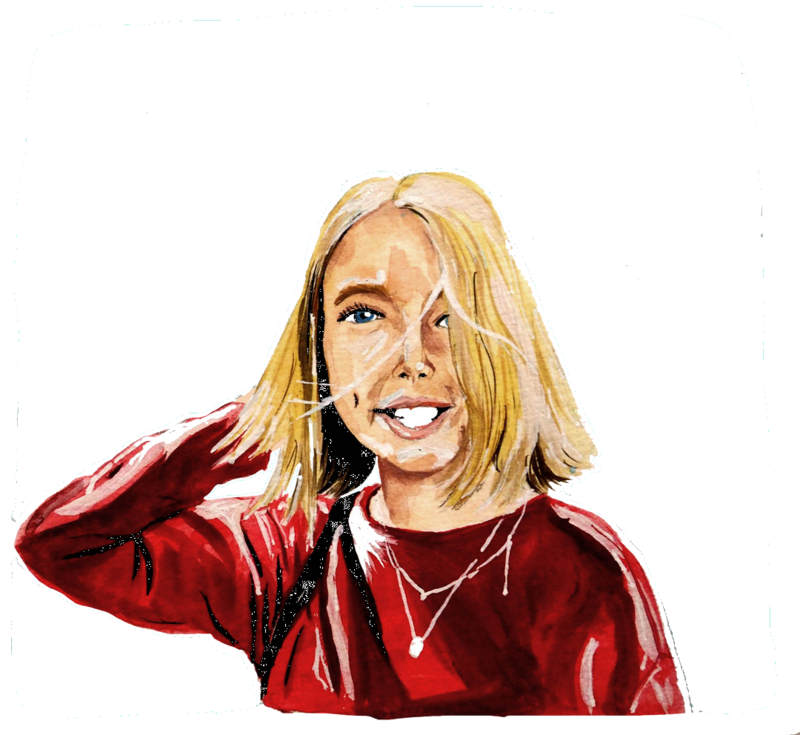 Once you see the work that goes into a piece that’s in an exhibition and is taken as art and then you see the same garment in a shop for a distinctly cheaper amount of money – it doesn’t mean a lot less effort has been put in and that’s one of the issues with fast fashion. Although, there are distinct differences between high-street fashion and pieces that have adorned the catwalk. To put them in the same category and quantify them both as ‘art’ would be perhaps too far fetched but I think sustainable and ethical fashion is in a category of its own. It’s beautiful in the way it is better for the environment, it isn’t extortionately priced yet like avant-garde, designer garments and it holds meaning. The replicants and dupes of catwalk pieces that the consumer buys in order to replace the ephemeral pieces that walk designer shows are where art and fashion part ways. Mass made and mass produced, fast fashion loses the beauty that high-end designers perhaps have. It loses its reverence in order to appeal to the mass public. There is a difference but I think that is where ethical fashion is art. It has meaning, is accessible and has a purpose. Maybe, fashion is not a form of art explicitly but maybe some forms are. 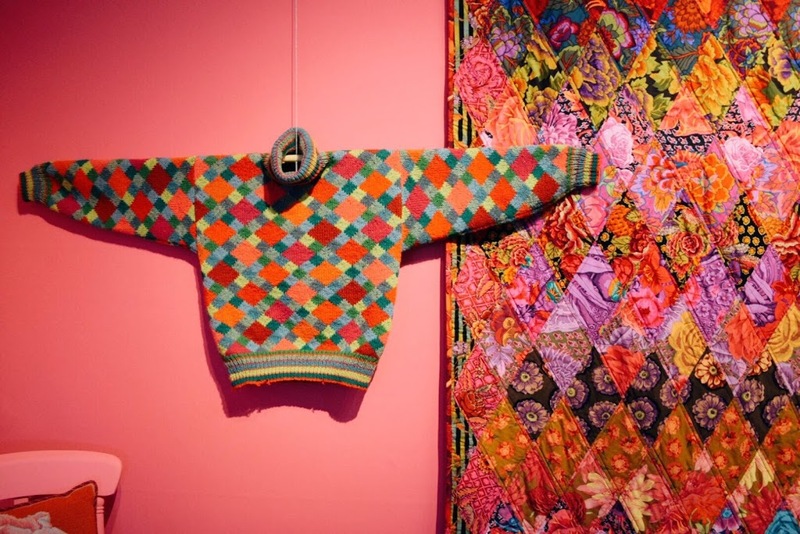 Do you think that fashion should perhaps be regarded as art? If yes, why? If no, why not? This exhibit has really made me think about the way in which I view fashion and has further cemented my view that if we do regard art so highly why not fashion? It is not something to be disposable and although it may have a slightly different purpose (i.e. to wear). I think further still you cannot but fashion as a whole into the ‘art’ category because there are so many different types. Fast fashion? Maybe not? 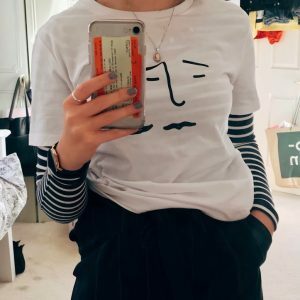 Ethical fashion? Maybe. Designer fashion? That’s up to the individual. I would love to know your thoughts on the topic. Loved reading this and I love the look of exhibition, the colours look amazing! I’ve never thought of fashion being art before but now I’ve read this I feel like I’d class more higher end fashion as art rather than fashion from high street stores like Primark and New look. I’m not sure why but maybe because they’re lower quality but I definitely agree with everything you said!! Loved this post!! I think there's a distinction between fashion that has been made to reflect art and then the everyday side of fashion, the more realistic one. We all view Coco Chanel or Dior's pieces as art, because they are. There is craftsmanship and intricacy in the items. But those aren't feasible reasons to spend thousands on them "because they reflect art more sincerely" Besides, most of their clothes can be quite avant-guarde anyway. We're cornered into buying the next best thing which is clothing from high street stores because as much as some of us would like to buy into the clothes like the ones shown in this exhibition, it is not realistic. And again, there is a difference between luxury clothing and "normal" clothing- it is made specifically with the aim of being aesthetically pleasing and therefore is not mass made because the designers must know it's not accessible to everyone whereas fast fashion is. I don't know if I'm rambling but I think there is a distinction between fashion and art because there are different strains of fashion. The exhibition seems cool though..
One of the best software development & design company in India, ITSWS Technologies provide website developments, e-commerce sites, mobile apps, SEO, SMO and online marketing services at on best price.